As reported recently by Urban Review STL, St. Louis University continues its poor track record in historic preservation as it plans to demolish yet another building in the Midtown National Register Historic District. This time it is a stately mansion that is in the way of a future entrance to their to be re-vamped law school. 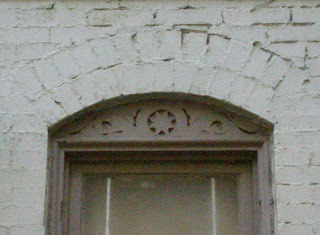 According to City records, the mansion was built in 1904, however its Second Empire suggests it may have been earlier. 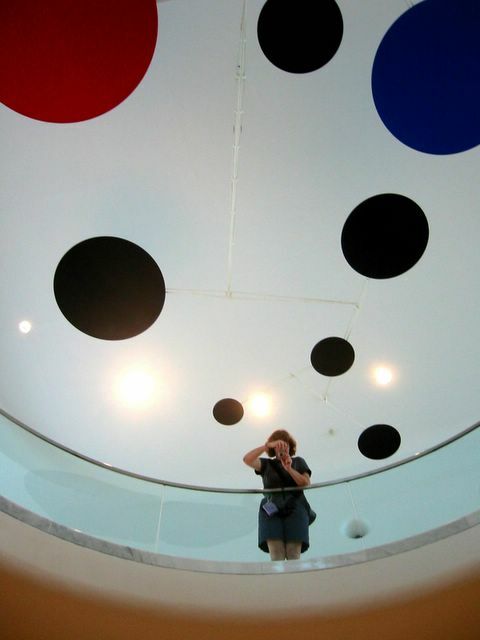 The structure currently houses the university's Center for Counseling & Family Therapy. 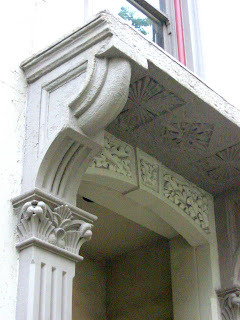 A detail of the mansions beautiful entrance. The projecting canopy appears to have been given a frontal lobotomy at some point. A view of the rear of the mansion with Lindell Towers and the Coronado across the street. The larger Romanesque style mansion to the east, which was connected to the law school during a previous renovation fortunately will remain. 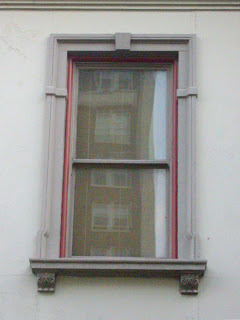 Apparently to SLU the Second Empire style does not have as much curb appeal and is therefore expendable. 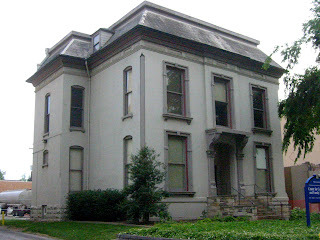 Another building west of the mansion, which lacked architectural distinction has already been demolished. 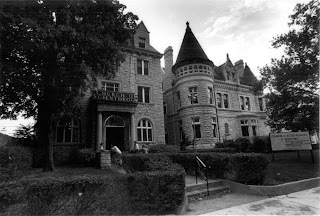 3740 Lindell is not the first mansion to be demolished for the law school as evidenced by the photo below from the nomination for the Midtown Historic District taken in 1977. The location of the mansion on the left is currently a courtyard with a fountain that sits between the Romanesque mansion and the current law school building which was completed in 1980. The rendering below, from SLU's website shows the proposed expansion and re-cladding of the existing law school. It appears that there would be room to keep the mansion at 3740 in the space between the Romanesque mansion and the wing of the law school to the west. It is unclear if the wing to the west is new or simply a re-cladding of the existing modern style building at 3750 Lindell. The width of the existing building and its entrance appear to align with those in the rendering. It is also apparent that there would have been room for the mansion demolished for the 1980 building to remain in the fenced space east of the Romanesque mansion. Both of these scenarios would require SLU to come to terms with the fact that it is an urban campus. Here are a few examples of the many buildings that SLU has demolished over the years. 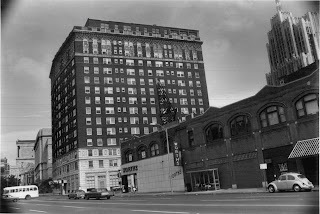 Below is a photo from the nomination for the Midtown Historic District showing the Marina Building that stood at Grand and Lindell until 2002. 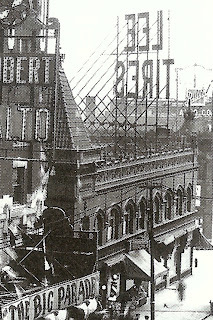 Below that is a photo showing the building as it appeared when it was built, complete with corner towers and a decorative cornice that had been removed. Instead of renovating, which could have encouraged other adjacent but smaller development on the Jack-in-the-Box site, it was demolished in hopes that something bigger and better would be developed on the site. Five years later, SLU currently has out its second RFP for this site, and it remains to be seen what will ultimately get built (hopefully something worth the wait). 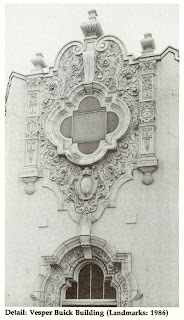 On the west end of campus, SLU demolished both the 7 story Olympia Apartments (see earlier post) in 1993 and in 1995, Preston Bradshaw's unusual Spanish Colonial Revival styled Vesper Buick building. The 1927 Vesper building had been built as an auto dealership, but is today a parking lot (logic error). The Olympia site is a parking lot as well. Great post, Paul. SLU's response to being an urban campus is to create an impermeable fortress-like wall along all edges, to protect the verdant greens and gracious plazas within. This is a distinctly urbane strategy, particularly if your neighbors are Huns set on ransacking the place. A heretical thought: I almost wonder if the two mansions should be left without the faintest remnant of their context intact or simply allowed to die with some sense of dignity? It's like pulling an illustration out of an antique book and framing it to hang on the wall. Something critical is lost in translation. Lisa, SLU people that have been mugged, assaulted, raped, had their cars broken into are a little more forgiving when it comes to the "impermeable fortress-like wall." The University has a responsibility to the safety of its community. Hopefully, there will be a day when they can be more open, like a pastoral campus in exurban settings but in the meanwhile, maybe you should talk to some public safety people and ask them about the reality of crime in the area. j, you make the assumption that I was saying that the building of an academic fortress is a bad thing. It's a common conceptual strategy for college campuses everywhere, whether in an urban area or in the middle of the country. The quadrangle surrounded by ivy-covered walls is quintessential image of the university in our minds. Indeed, I think it's even more appropriate in a rural area, to build a focused sense of community. I live about 3/4 of a mile from SLU, walk & ride my bike around the neighborhood by myself, park cars, etc. I have no illusions about the safety of the area, either positive or negative. I'd like to know how feasible it is to move the house. Put the house on jacks and drive it about 5 blocks north. I'm sure they can find a lot that could use that beauty. I've seen and heard about houses being moved in other cities. Why not here? 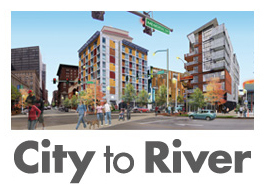 Why would someone want to study urban planning at SLU? um. this italianate mansion has never assaulted or raped anybody. it's a BUILDING, and a beautiful one at that. People study urban planning at SLU because it is the only urban planning program in the region, which shouldn't be a surprise. From your comment, you're suggesting that SLU's position and track record on land use are indicative of the quality or lack thereof in its urban planning program. The University administration does not confer with the planning program faculty on its projects. Phil's got an interesting idea there. My friend, architect Peter B. Smith, was involved in a project moving a home nearly that size in Parkview a couple of years ago .... but that takes a devoted client and an appropriate, proximite site to make it work. They should move to the site of the Livery stable and turn it into a nice wine bar/restaurant. How far is that site anyway? SLU could be convinced. Amen, anonymous. 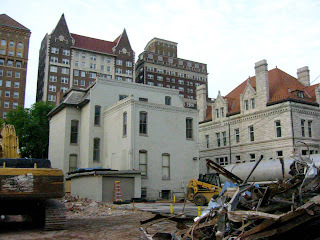 Demolishing an Italianate mansion does NOT make the neighborhood more safe. And tell me, does making SLU a fortress solve the problems around its campus? The way to eliminate crime in Grand Center (and SLU) is to make the area a vibrant retail and residential area again. An empty parking lot isn't going to call the cops on criminals or rush to your aid if you're being mugged. It's so sad Father Biondi gets his way, no matter what. I just read he threatened to move St Louis University to West County if the St Louis Preservation Board doesn't let them demolish ALL of the old Pevely Dairy complex...yet another reason I'm glad I never converted to a Catholic. The corrupt administration of Richmond Heights is yet another.